Fill a saucepan with some water. Bring to a boil, then lower the heat to a simmer. Place a heatproof bowl on top and add the white chocolate, breaking it into pieces. Keep stirring until the chocolate has melted fully. Add the confectioner’s sugar, butter, milk, lime zest, and roughly chopped cranberries to the bowl. Mix thoroughly. Heat for a minute, remove the bowl, and give it a good stir. Repeat this process a couple of times until the mixture has a glossy look to it. Line a baking tray with parchment paper, roughly 20 x 15 cm/8 x 6 in. Spread the fudge onto the tray and transfer to the fridge to set. This should take about 20 – 30 min., but keep checking. Don't leave it too long as it may become too hard. 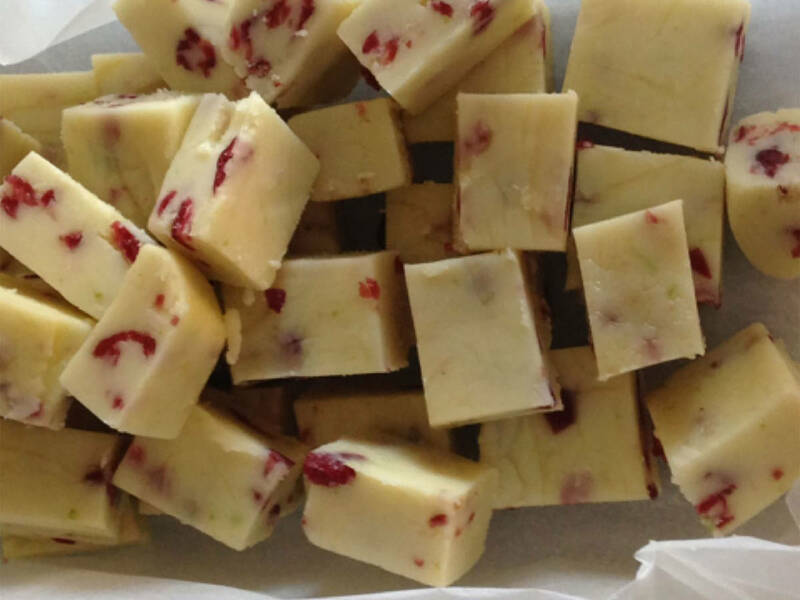 Remove from the fridge and cut into squares. Store in an airtight container.